This is by no means the first time a car thief has been defeated by a lack of the necessary skills, but I thought this was very nicely put. 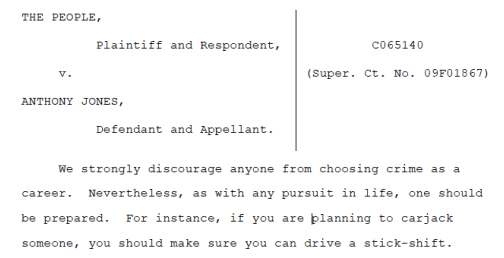 The main legal issue in the case (PDF) was whether the defendant's prior convictions in New York counted for purposes of California's three-strikes law (the court remanded for further proceedings on that). 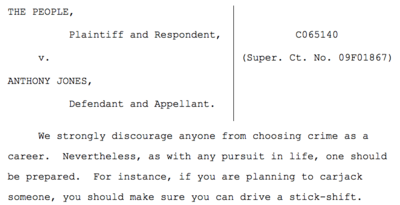 But the stick-shift issue was relevant because, "apparently unaware that starting a manual transmission vehicle requires depression of the clutch pedal," the defendant failed at this task and then ordered the victim to drive, thus converting what would have been a "straightforward carjacking" into kidnapping. The case could also be used to teach the importance of staying in shape, i.e., if you think you may need to flee from police dogs, you should make sure you can leap a retaining wall of reasonable height. Via Venkat Balasubramani on Twitter.